French-Swedish band Coexistence is returning with some everlasting scars, it is their second album following their debut Flow that I reviewed some years ago. I think that album was good and showed greater potential and now I have received a good-looking digipak that has a nice booklet to read while listening to the album. It both looks good and sounds good – I doubt any of the band’s fans will be disappointed with the new album and I don’t think anyone dislikes it so much that they want to injure the band in a way that leaves everlasting scars. Their music can be described as progressive metal or progressive rock, quite varied and with great production. Swedish vocalist Carl sings really well and I think the song writing has improved much since the debut; it is more direct and appealing this time. And they keep it short, unlike some of their progressive colleges who seem to believe that more is more; both playing time and the song lengths feels well weighted on this album. They have clearly taken a big leap forward compared with their debut and this time they have really managed to make something very interesting and a really strong album. And I think they are one of those bands who released albums in November that transformed this year from a quite poor music year to a fairly good one. Although I probably would not quite rate this as a top ten album of the year but it is really close. It is an album that has so much to offer and for you knowing that the progressive tree has many branches I can explain that this one belongs to the most interesting branch, the one built on strong melodies and interesting choruses. They seem to be inspired by the likes of Dream Theater and I really enjoy the fact that they keep their music easily accessible while still having those progressive touches that gives the album depth. I don’t really think this album has any major weaknesses, sure it could perhaps use a super duper hit song but What it Takes isn’t that far off being that song, I love that chorus. But I think all the tracks are good with the first half of the album being somewhat better than the second half and the nit-picking person might claim that it is a shame that the album looses a bit of the edge toward the end. But these are opinion of a critic’s excessive scrutiny, as a fan I can only conclude that it is a fun album. 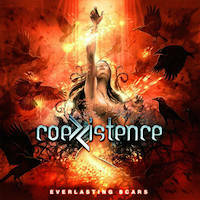 I think Coexistence have put together a great album called Everlasting Scars, an album that I recommend. And I don’t just recommend it to fans of progressive metal, I think that anyone who usually read what I write should have a look at this strong album – it will be well worth the time.